The Geneva Rotary Club was recognized at the Rotary District 5650 Conference in Lincoln on July 28, for the Best Community Service Project for Small Club for its Hands Only CPR project. 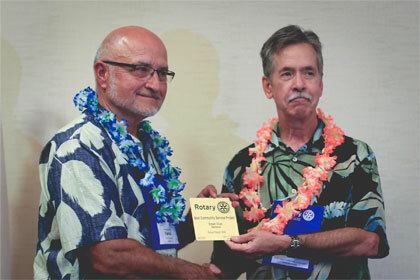 Harold Janda attended the luau-themed awards ceremony and received the award on behalf of the club. The CPR Challenge presented at the 2017 Rotary District 5650 Conference was heard loud and clear by the Geneva Rotarians in attendance who returned to their club motivated to reach the District CPR initiative, with a goal to teach at least 200 students how to conduct hands-only CPR. A local grant to the Fillmore County Foundation was written to cover the cost of 225 foam ambulances. Emergency Medical Service staff, volunteer Rescue Unit personnel from various communities, and Sheriff’s Department employees throughout Fillmore County volunteered to assist in training. To date, four different hands-only CPR training events have occurred at public schools in Fillmore County, training educators and school staff and students in grades 5-12. Because of the efforts of these groups and the Geneva Rotary Club, 439 people have learned hands-only CPR from this initiative, but the number of lives that may be saved is innumerable. A Fillmore County Foundation helped make this grant possible, along with the individuals involved that made this possible.